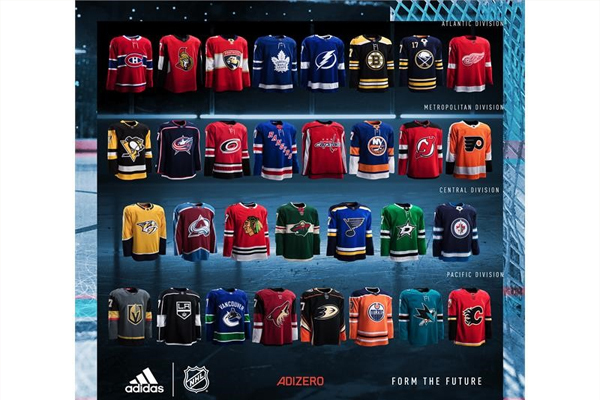 Yesterday in Las Vegas, Adidas and the NHL unveiled the new ADIZERO Authentic NHL jerseys. Lighter – Featuring new cresting materials and construction technology, the ADIZERO Authentic NHL jersey delivers a new jersey that is up to 19% lighter when compared to the current NHL Jersey. Cooler – The ADIZERO Authentic NHL jersey features adidas Clima® technology in each of the jersey fabrics to deliver breathability that maximizes air flow circulation with materials that are up to 133% more permeable than fabrics currently used. Stronger – Constructed for durability, the fabrics are up to 27% stronger in burst testing and up to 72% tougher in abrasion testing compared to the current NHL jersey. Rapper, singer, producer and songwriter Desiigner, comedian Russell Peters, adidas ambassadors Connor McDavid and Patrice Bergeron, as well as a number of NHL athletes nominated for awards, were on hand to celebrate the launch. The jerseys will make their on-ice debut with the 2017-18 season.